If you watch the news, go on Facebook, or even talk to other people, you’d be forgiven for thinking our world is in a very bad spot. Luckily, the truth is that things aren’t as bad as so many think. 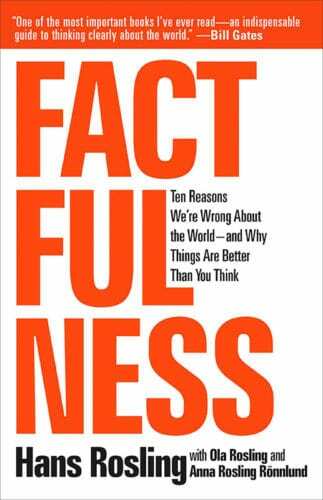 Factfulness: Ten Reasons We’re Wrong About The World — And Why Things Are Better Than You Think shows why our own picture of things is likely off. The world isn’t as bad as it seems. That’s the reality author Hans Rosling seeks to show in Factfulness: Ten Reasons We’re Wrong About The World — And Why Things Are Better Than You Think, with the help of daughter-in-law Anna Rosling Rönnlund, and son Ola Rosling. Hans begins with a quiz on the state of various areas of humanity. Education rate of women around the world, vaccination rate of children, number of deaths each year from natural disaster, and more. How’d you do? If you’re like even the most educated in the world, chances are you got very few answers right. This is just our first look at how most have a much more negative world view than that of reality. By exploring each of these instincts, we see how they can lead us to miss the great progress made in many areas of humanity. These instincts mislead us into believing things are in a worse state than they are in reality, blinding us to the truth. Insightful stories from the author’s own life help readers to understand how we can easily miss the realities of the world around us, or be lead astray. Factfulness provides tools we all need to see the world with much more clarity. A great read from start to finish, this book will really open your eyes to the true state of our world and help you to see through the fog of falsity we often face. Grab a copy of Factfulness: Ten Reasons We’re Wrong About The World — And Why Things Are Better Than You Think from Amazon now. Learn to see through the false and find the facts of the world we live in.